I apologize for the cheesy title. I thought of it because Craig recently put me in the mind of Donnie Darko with this video, and so I remembered Sparklemagic. When I was at the Hulme Community Garden Centre for Apple and Pumpkin Day, I picked up a good handful of lovely looking peppers. Some Scotch bonnets, some jalapenos, some delicious looking finger red peppers. They offer their produce for donation, not sale, as they're a community centre, not an official farm. I got my heap of peppers home and thought, "Right. Now what do I do with them?" 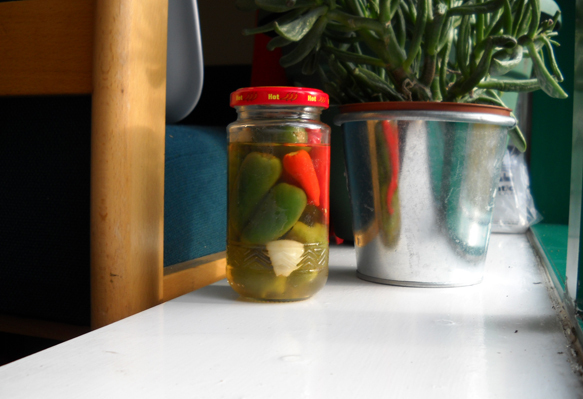 It was only enough for one small jar of pickles with one clove of garlic. But I reckon if I'd tried to pickle up the 7 or so jars Craig and I normally did in Sydney, my flatmates would have sued me for harassment via vinegar. I cheated, as I always do, and starting eating them the day after putting them up–you're supposed to wait a week for full pickling. They are already some of the tastiest peppers I've ever eaten, especially on some cheese toast. And I need to send a big thank you to Craig-- I just received an early birthday present. I'm listening to the News Quiz Show on Radio 4 as I type. Thank you, my dear. It's lovely. It's just wonderful to have a radio again. Lovely peppers, my dear! I have one slight correction: the reference from Donnie Darko should be to Sparkle Motion, but I think titling this blog "Pickle Motion" would have put you on some kind of government watch list, so it's all for the best! I'm glad to hear you got your radio and are enjoying it! Happy Nijaween!